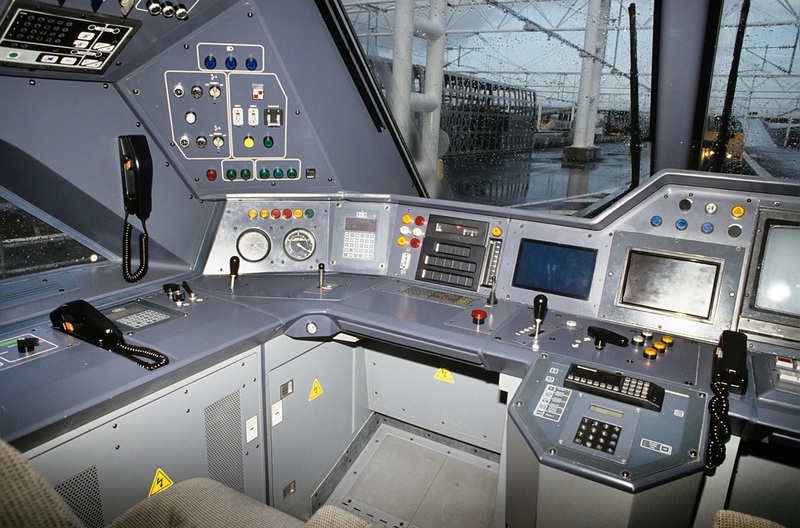 Left: Class 70, Southern Railway/BR electric CC1-CC3 (20001-20003). 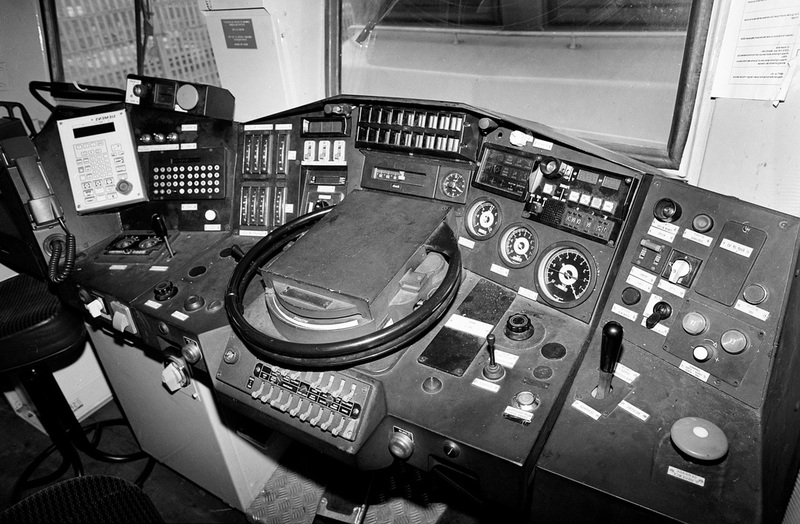 Above: Class 71. Detail to follow. 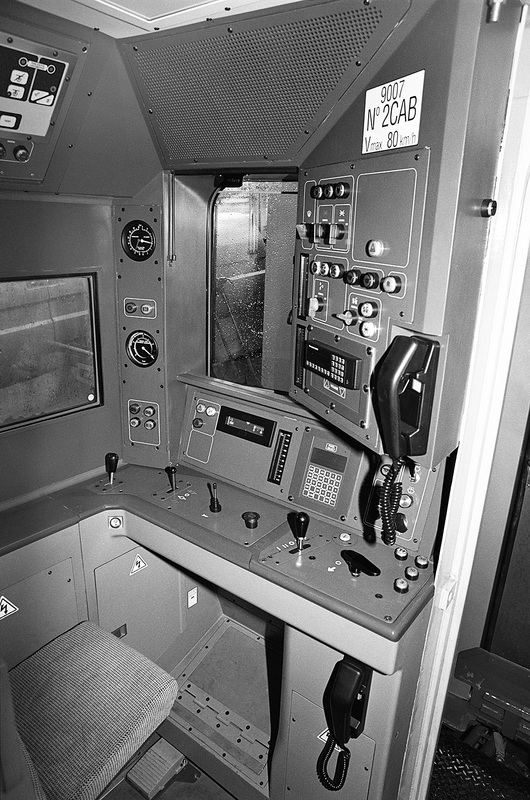 Above: Class 73/0 driving cab - No. E6003 restored and modified by Selhurst. 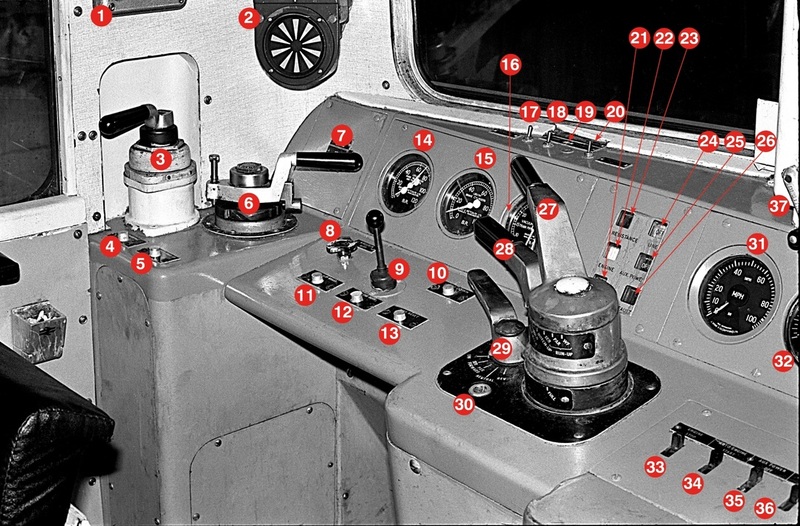 Above: Class 73/1 drivers side. 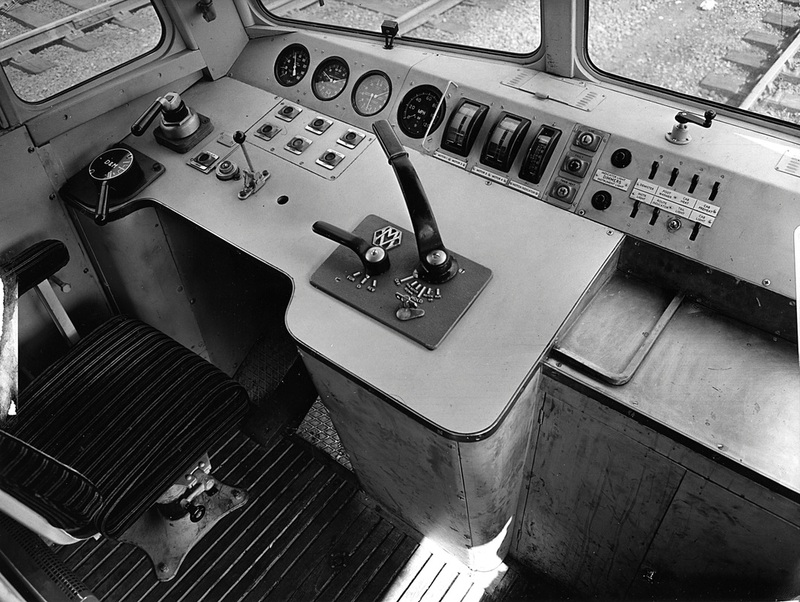 Class 73/1. 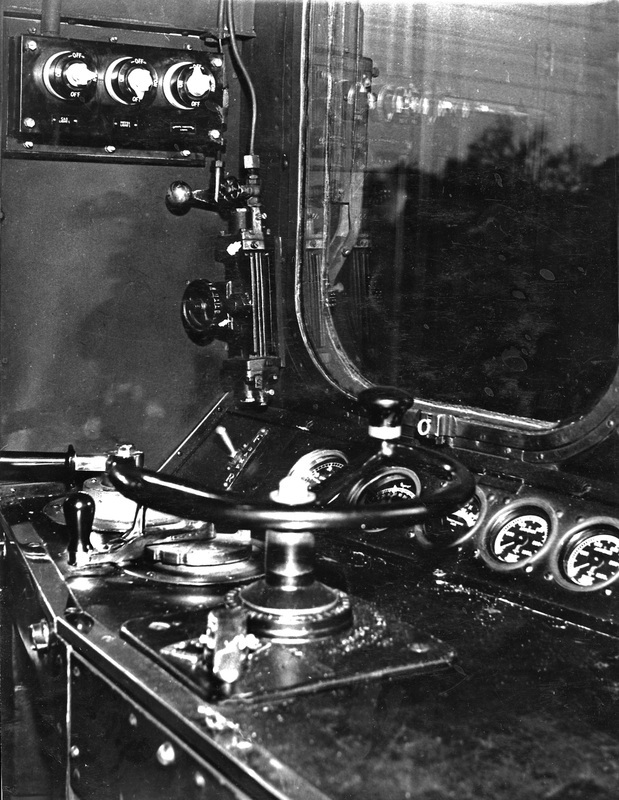 1: Cab-cab ‘Loudafone’, 2: AWS indicator, 3: Straight air brake valve, 4: Sand apply button, 5: Exhauster high-speed button, 6: Train brake controller, 7: Brake selector switch (Auto air/electro-pneumatic), 8: Windscreen wiper valve, 9: Horn valve, 10: Shoe down button, 11: Anti-slip brake button, 12: Rear horn button, 13: AWS re-set button, 14: Main reservoir and train pipe gauge, 15: Brake cylinder pressure gauge, 16: Vacuum gauge, 17: Driver’s window demister switch, 18: Route indicator light switch, 19: Headlight switch, 20: Instrument light switch, 21: Wheelslip flag, 22: Engine running flag, 23: Control resistance flag, 24: Line supply flag, 25: Auxiliary power flag, 26: Fault flag, 27: Driver’s side electric power controller, 28: Driver’s side diesel power controller, 29: Master switch, 30: Driver’s key socket, 31: Speedometer, 32: Traction ammeter, 33: Engine stop switch, 34: Auto engine start switch, 35: Auxiliary power off switch, 36: Auxiliary power on switch, 37/38: Route indicator handle, 39: Secondman’s Demister switch, 40: Reset switch, 41: Fitted / unfitted brake switch, 42: Fire alarm test switch, 43: Train heat off switch, 44: Driver’s side cab heat switch, 45: Train heat on switch, 46: Secondman’s side cab heat switch, 47: Train heat interlock cut out switch, 48: Secondman’s side electric power controller, 49: Secondman’s side diesel power controller, 50: Secondman’s side master switch, 51: Secondman’s side shoe down button, 52: Secondman’s side AWS reset button, 53: Secondman’s side horn valve, 54: Secondman’s side windscreen wiper valve, 55: Secondman’s side anti-slip brake button, 56: Secondman’s side train brake controller, 57: Secondman’s side straight air brake valve, 58: Secondman’s side exhauster speed up button, 59: Secondman’s side sand button. Above: CLass 73/1 secondmans side. 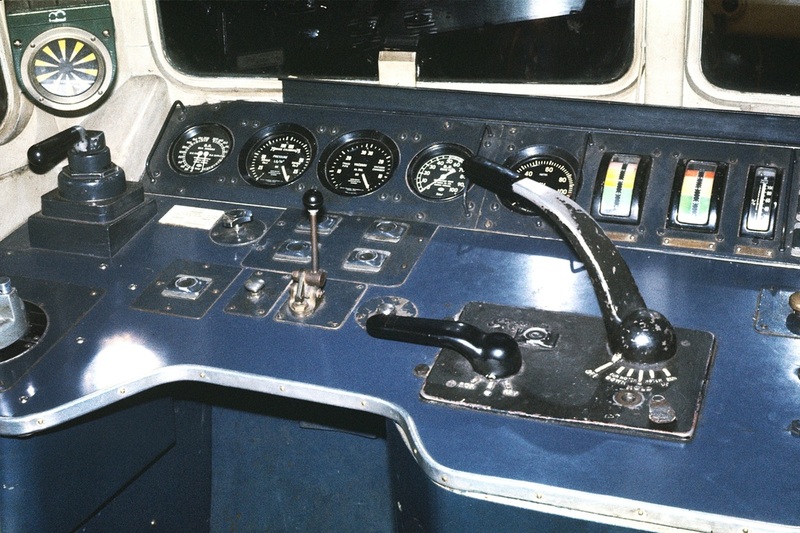 Left: Class 73 dual power controller. Top (round) electric, lower (square) diesel. 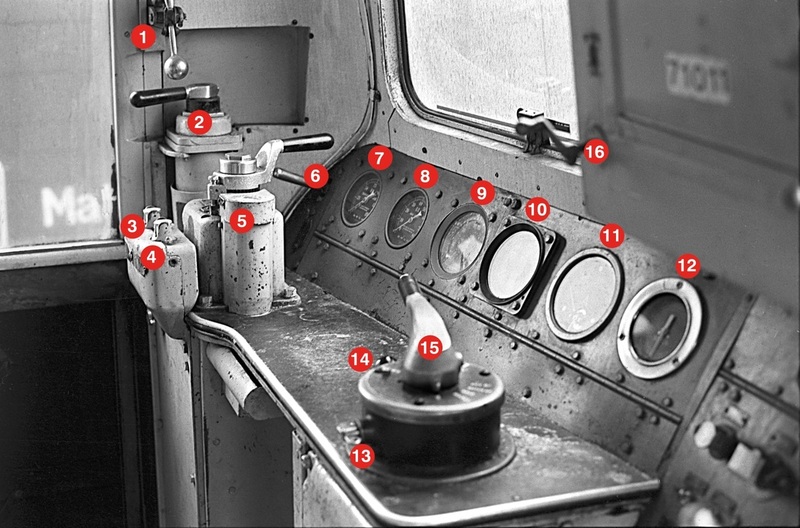 Above & Below: Class 74. 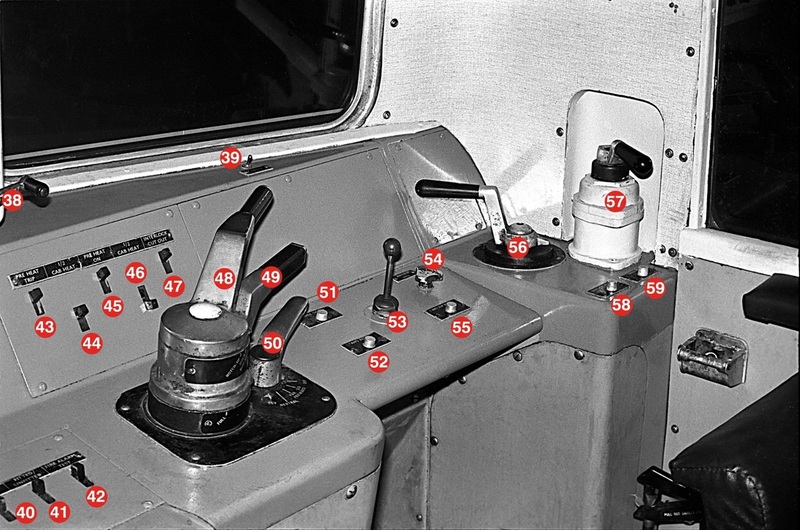 Driving cab controls of Class 74. 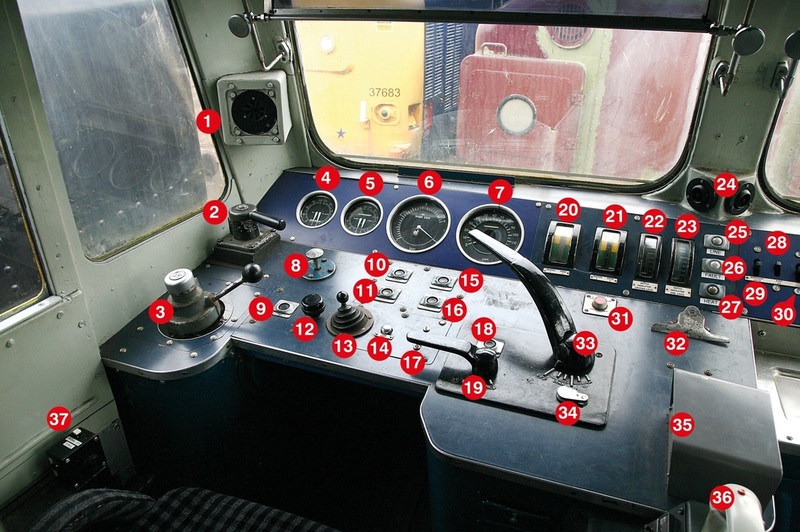 1: Straight air brake valve, 2: AWS indicator (if fitted), 3: Exhauster high speed button, 4: Anti-slip brake button, 5: Train brake controller, 6: Sand application handle, 7: De-mister switch, 8: Duplex gauge, 9: Brake cylinder pressure gauge, 10: Vacuum brake gauge, 11: Route indicator switch, 12: Desk illumination switch, 13: Rear cab horn button, 14: Horn valve, 15: Master key socket, 16: Series/Parallel switch, 17: Engine running flag, 18: Fault flag, 19: Power controller, 20: Master switch, 21: AWS re-set button (if fitted), 22: Auxiliary power flag, 23: Line indicator flag, 24: Shoe down button, 25: Original position for rear horn button, 26: Speedometer, 27: Traction ammeter, 28: Headcode blind handle, 29: Headcode box door, 30: Secondman’s windscreen wiper valve, 31: Headcode blind handle, 32: Handbrake wheel, 33: AWS reset button (if fitted), 34: Shoe down button, 35: Horn valve, 36: Rear horn button, 37: Exhauster speed high speed button, 38: Secondman’s side power controller, 39: Secondman’s side train brake controller, 40: Cab locker, 41: Secondman’s side straight air brake valve. Cab from No. 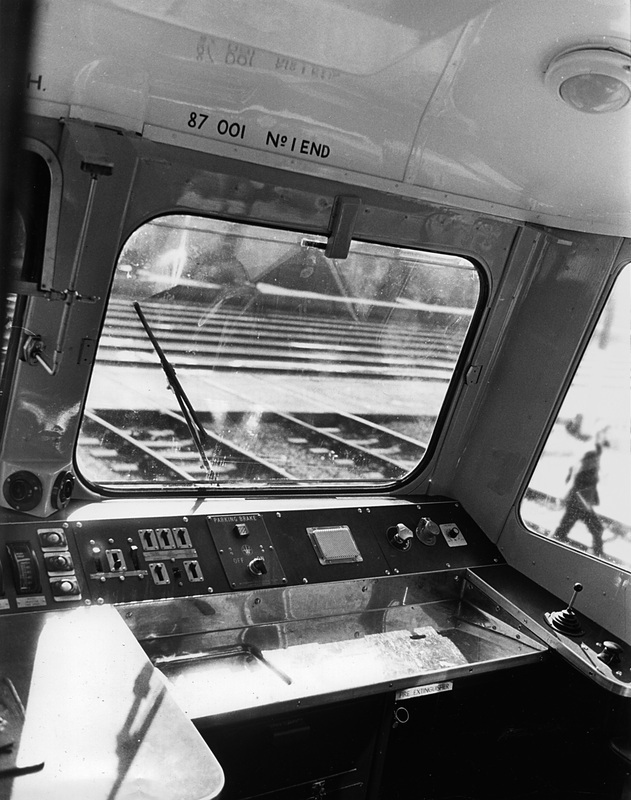 74002 illustrated in 1970s condition. 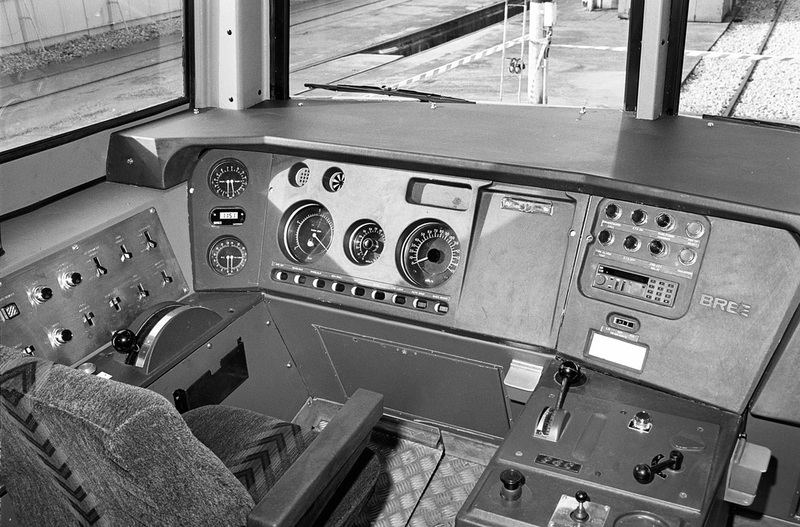 Above: Class 76, driving position. Above: Class 77 No. 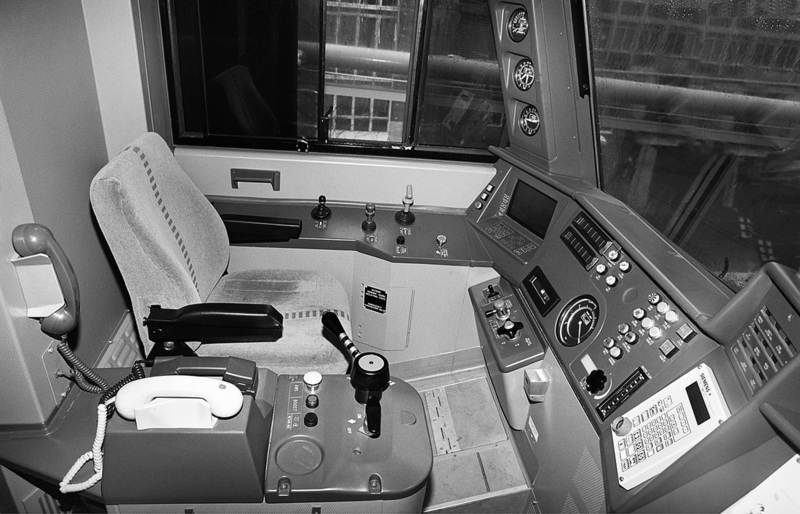 E27001. 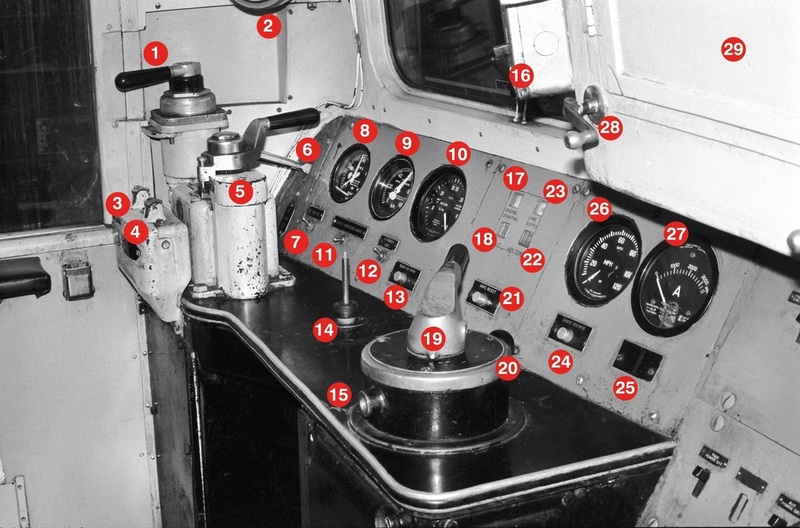 Above: Class 81 (AL1). 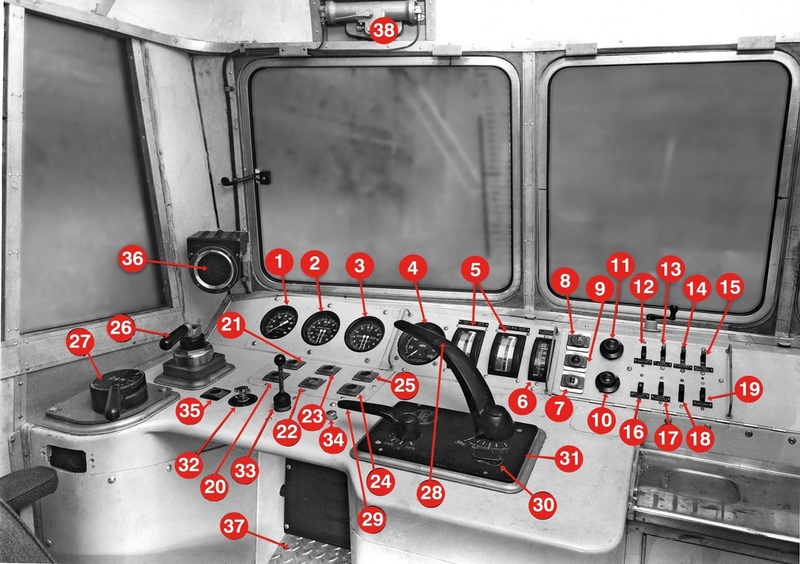 1: Main reservoir pressure gauge, 2: Bogie brake cylinder pressure gauge, 3: Vacuum train pipe/chamber gauge, 4: Speedometer, 5: Traction motor 1-4 amp meters, 6: Notch indicator, 7: Train heat ‘on’ warning light, 8: Line light (overhead power energised), 9: Fault light, 10 & 11: Instrument light controls, 12: De-mister switch, 13: Foot warmer switch, 14: Cab heat switch, 15: Cab pre-heat switch, 16: Instrument light switch, 17: Route indicator light switch, 18: Tail light switch, 19: Cab light switch, 20: Exhauster stop button, 21: Exhauster start button, 22: Pantograph down button, 23: Pantograph up/reset button, 24: Train heat off button, 25: Train heat on button, 26: Locomotive straight air brake valve, 27: Automatic brake valve (train and proportional on loco), 28: Main power controller, 29: Master switch, 30: Master key socket, 31: Power controller pedestal, 32: Windscreen wiper valve, 33: Warning horn valve, 34: AWS reset button, 35: Anti-slip brake button, 36: AWS ‘sunflower’ indicator, 37: DSD pedal, 38: Windscreen wiper air motor. 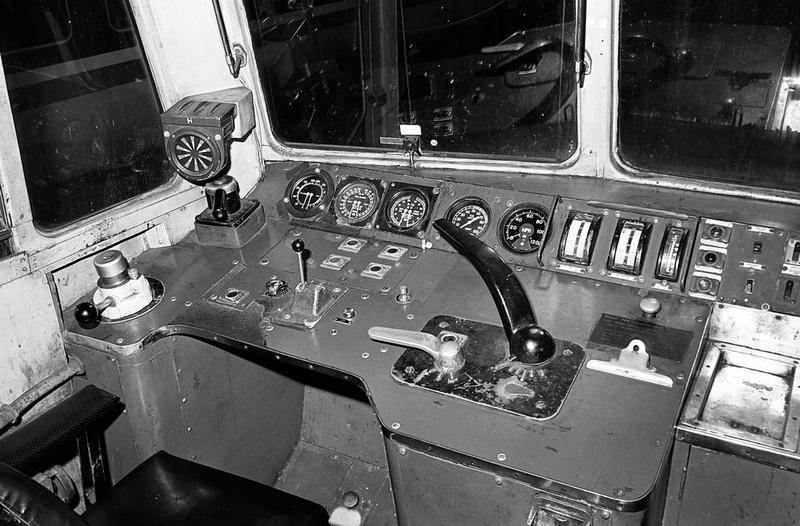 Above: Class 81, later days. 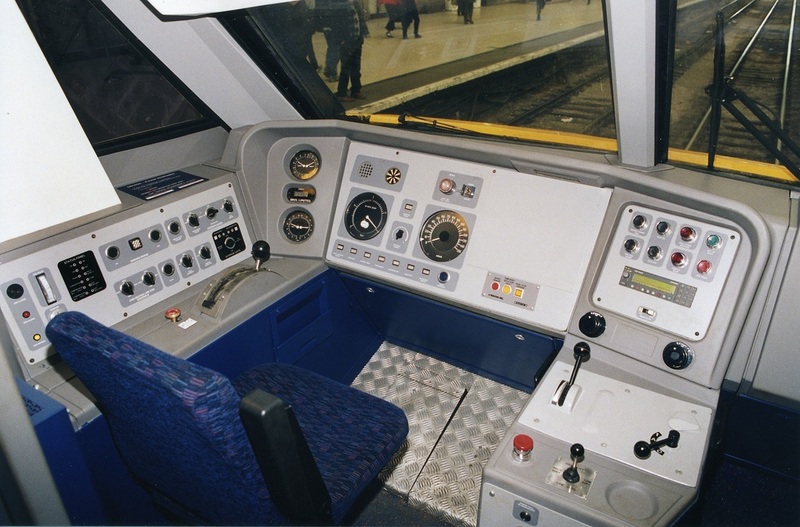 Left: Class 86 driving cab layout, showing as built condition. 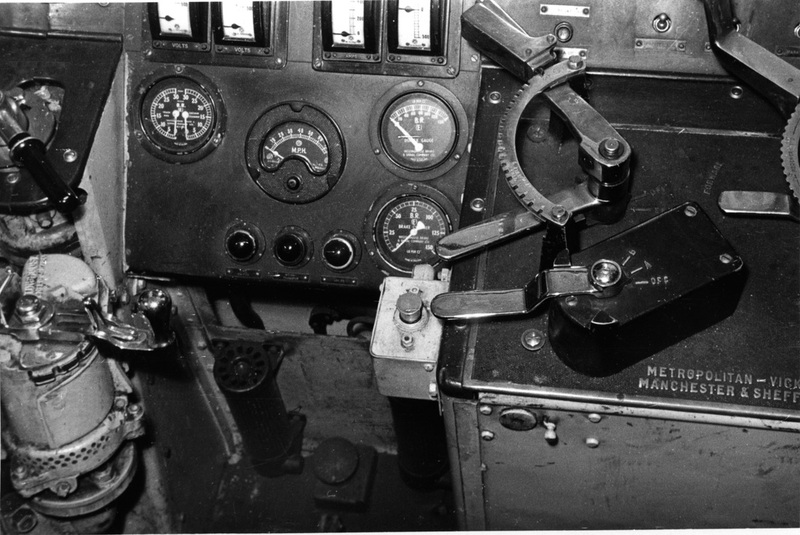 A - Straight air brake valve, B - Automatic Warning System (AWS) sunflower indicator, C - Main Air reservoir pressure gauge, D - Bogie brake cylinder pressure gauge (left side for bogie 1 and right side for bogie 2), E - Vacuum brake gauge (left side for vacuum pipe and right side for vacuum chamber, F - Automatic air brake pipe gauge, G - Speedometer, H - Traction motor amp meters (left gauge for Nos. 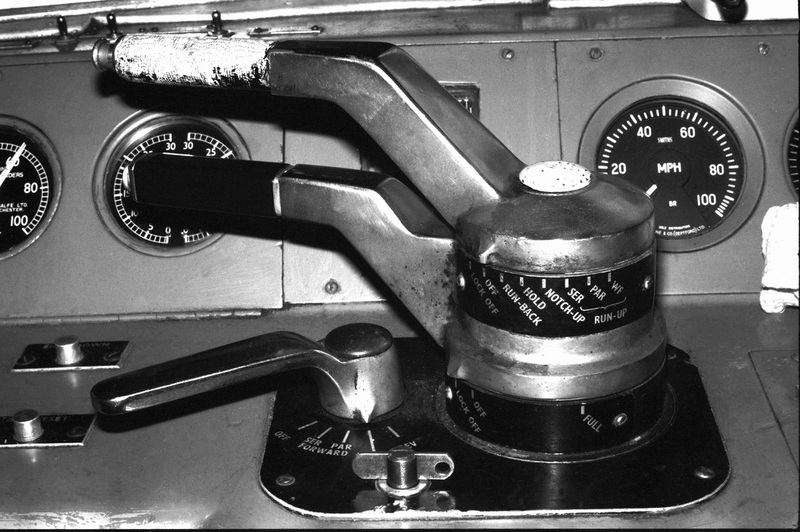 1 & 2) right gauge for Nos. 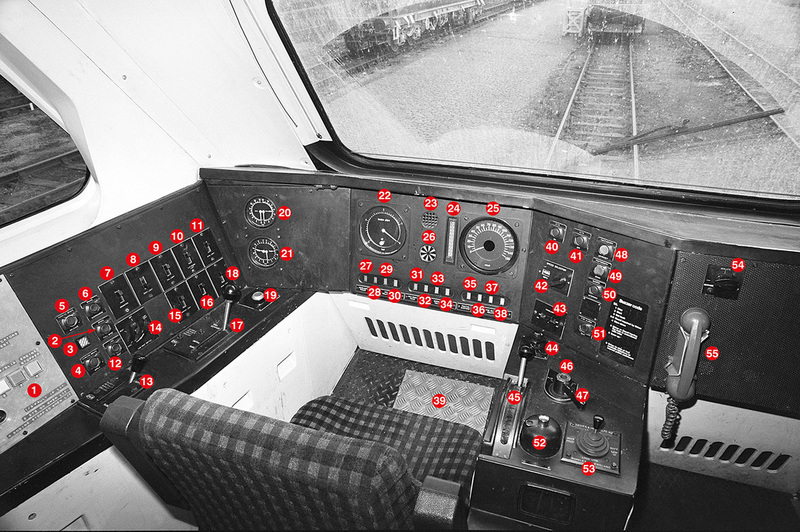 3 & 4), I - Route display windows and control handle, J - Notch indicator, K - Indicator lights (top-bottom) Line light (indicating overhead power supply available), General fault light, Electric train head ‘on’ light, L - Light switches (left to right) Instrument lights, Indicator lights, Tail lights, M - Equipment switches (top row left to right) Foot warmer, Cab heat, Cab pre-heat, (bottom row left to right) Window demister, Route indicator lights, Cab lights, N - Train brake valve (proportional on loco), O - Anti-slip brake button, P - Windscreen washer push button, Q - Windscreen wiper control valve, R - Warning horn valve, S - Push buttons (left pair) Pantograph up/reset button (above), Pantograph down button (below), (right pair) Electric train heat on (above ) Electric train heat off (below) T - Automatic Warning System reset button, U - Master switch, off, forward, neutral, reverse (interlock button behind), V - Drivers Safety Device hold over button, W - Ash tray, X - Main power controller, Y - Drivers Safety Device (DSD). 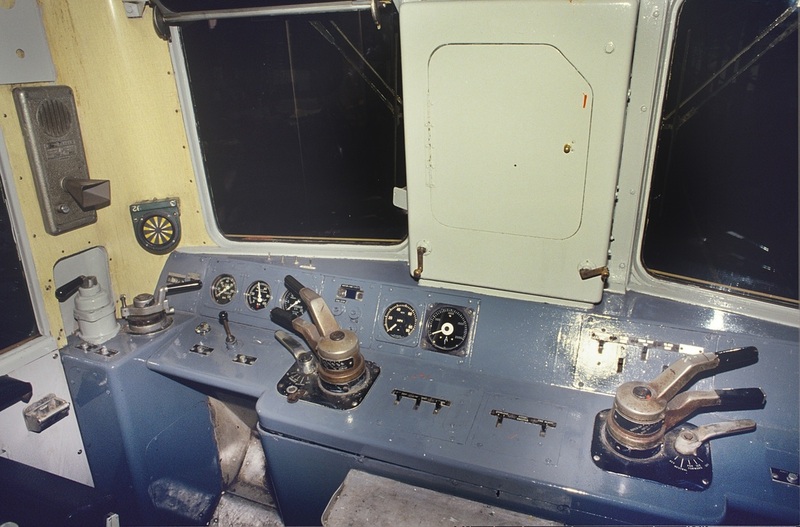 Above: Class 86/4 No. 86426. 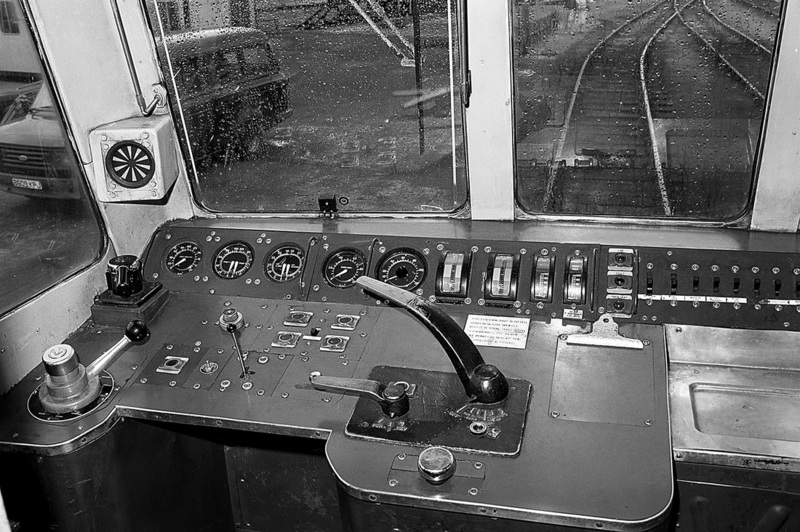 Left: Class 87 non-driving side. 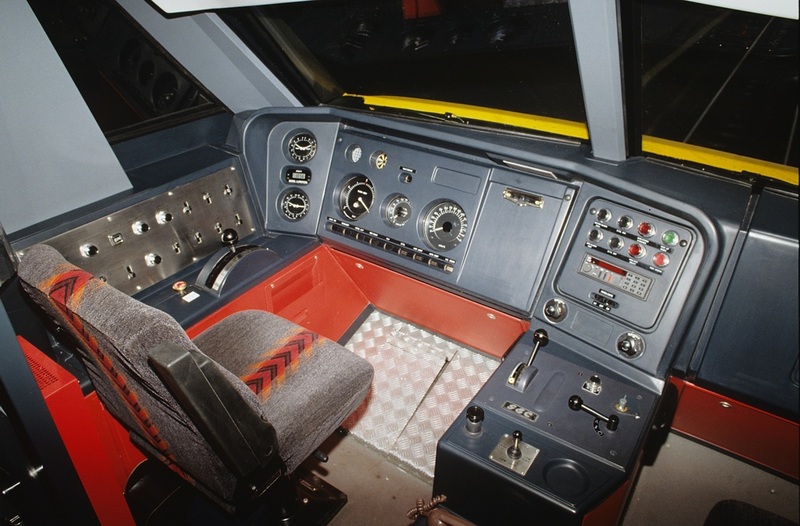 Above: Class 89. 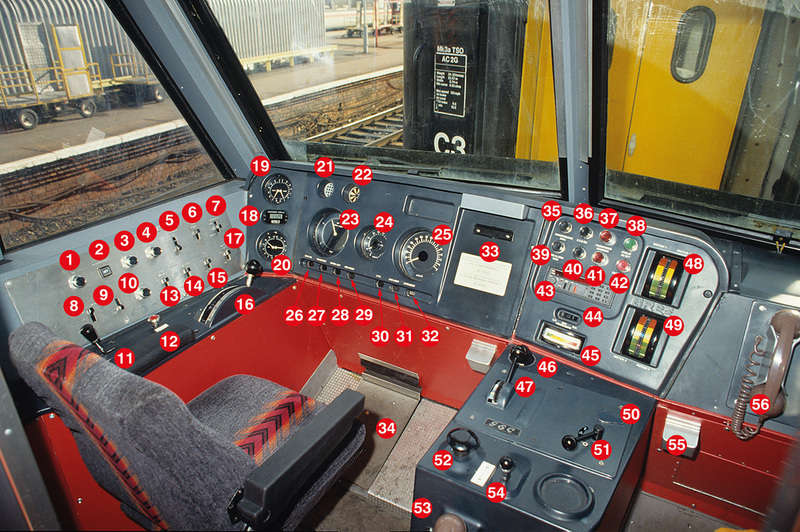 1: Later fitted control panel for working with Class 43 'surrogate DVTs', 2: Brake full bore button, 3: Parking brake indicator, 4: Parking brake apply button, 5: Parking brake release button, 6: Brake overcharge button, 7: Demister switch, 8: Body light switch, 9: Tail light switch, 10: Clipboard light switch, 11: Desk light switch, 12: LED test button, 13: Independent brake controller, 14: Cab heat switch, 15: Marker light switch, 16: Cab light switch, 17: E70 Automatic air brake controller, 18: Desk light switch, 19: Emergency brake plunger, 20: Main reservoir & main reservoir pipe gauge, 21: Bogie brake cylinder gauge, 22: Brake pipe pressure gauge, 23: AWS audible indicator, 24: Tractive effort and brake effort gauge, 25: Speedometer, 26: AWS 'sunflower' indicator, 27: Headlight failed warning LED, 28: Wheelslip warning LED, 29: AWS isolated warning LED, 30: Pass-com warning LED, 31: Rheostatic brake failed LED, 32: Spare, 33: General fault LED, 34: Parking brake on LED, 35: Traction motor over temp LED, 36: Line indicator LED, 37: Fire bottle isolated LED, 38: Train supply LED, 39: DSD foot pedal, 40: Electric train supply on button, 41: Electric train supply off button, 42: Speed selector pre-set switch, 43: Headlight selector switch, 44: Windscreen wiper valve, 45: Main power controller, 46: Master key socket, 47: Master switch (forward, neutral, reverse, off), 48: Pantograph up or reset button, 49: Pantograph down button, 50: Cab-Guard intercom button, 51: Fire alarm test button, 52: AWS reset button, 53: Horn valve, 54: Brake test switch, 55: Telephone hand set (driver-guard). Above & Below. 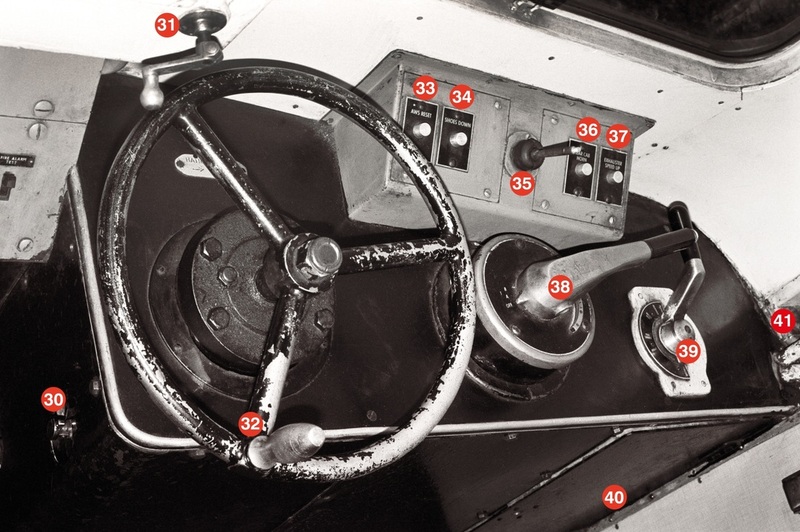 1: Parking brake on button, 2: Parking brake indicator, 3: Parking brake off button, 4: Brake overcharge button, 5: Instrument light switch, 6: Cab light switch, 7: Clip board light switch, 8: Cab air control - heat, vent, cool, 9: Cab air control - high, low, 10: Sand apply button, 11: Straight air brake controller, 12: Emergency brake plunger, 13: Foot warmer switch, 14: Demister switch, 15: Tail light switch, 16: Automatic air brake controller, 17: Marker light switch, 18: Clock, 19: Brake cylinder pressure gauge, 20: Main reservoir gauge, 21: AWS audible alarm, 22: AWS 'sunflower' indicator, 23: Air brake pipe gauge, 24: Speed selector switch, 25: Speedometer, 26: AWS isolated LED, 27: Headlight LED, 28: Wheelslip warning LED, 29: General fault warning light, 30: Electric train supply status LED, 31: Overhead power line status LED, 32: Pantograph auto drop LED, 33: Clip board, 34: DSD pedal, 35: Driver-guard call button, 36: Electric train supply on button, 37: Pass-com override button, 38: Pantograph up and reset button, 39: Fire alarm test button, 40: Electric train supply off button, 41: Fire extinguisher delay button, 42: Pantograph down button, 43: Cab radio, 44: Headlight switch, 45: Thermal indicator (traction motor heat), 46: Windscreen wiper valve, 47: Power controller, 48: Traction motor 1/2 ammeter, 49: Traction motor 3/4 ammeter, 50: Master key socket, 51: Master switch (forward, neutral, reverse, off), 52: AWS reset button, 53: Cab radio handset, 54: Horn valve, 55: Ash tray, 56: Driver-guard telephone handset. 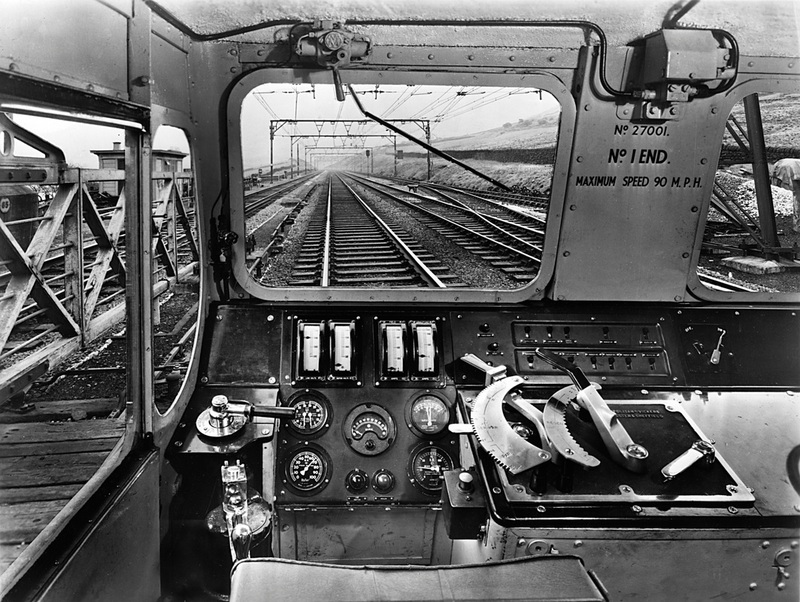 The view above is from loco No. 90001 when brand new. 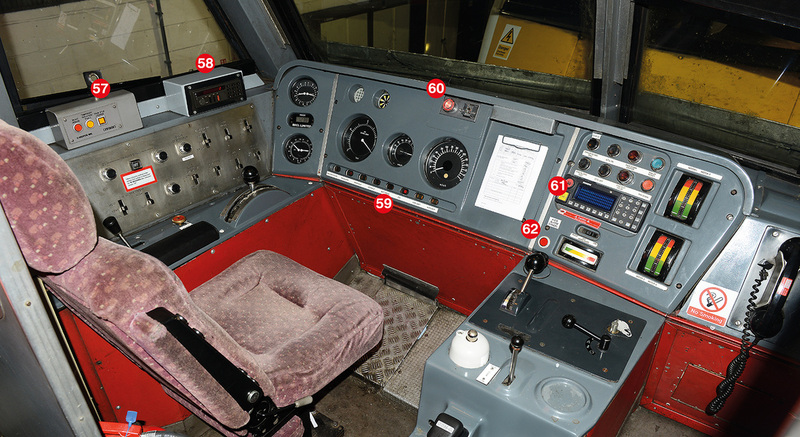 The view below shows the 2014 modifications on Greater Anglia locos.. 57: TPWS equipment, 58: Cab radio equipment, 59: Battery status, 60: Driver's reminder appliance, 61: GSM-R radio, 62: ADD (Pantograph Auto Dropping Device) alarm cancel. 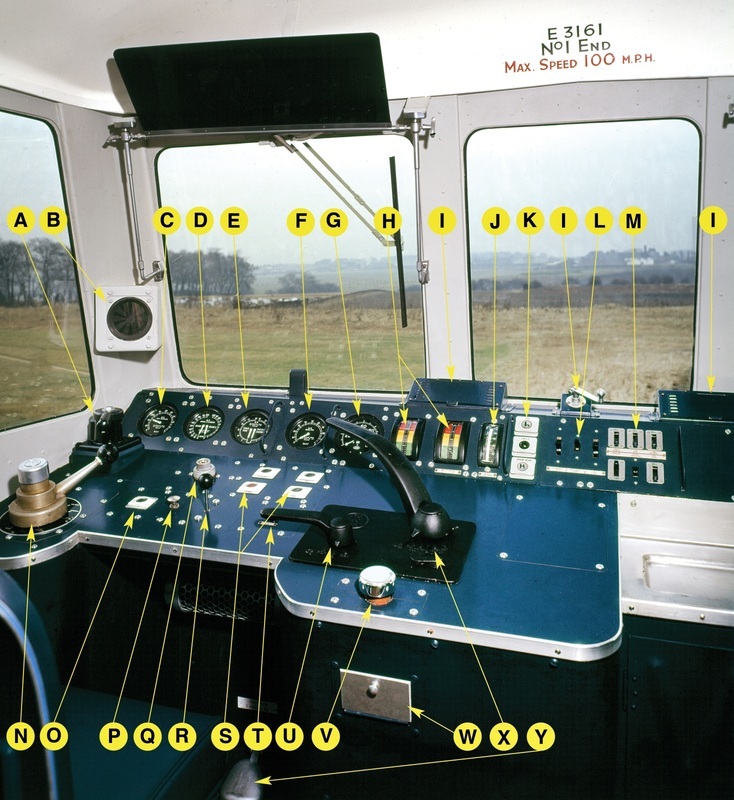 Cab illustrated is from No. 90007. 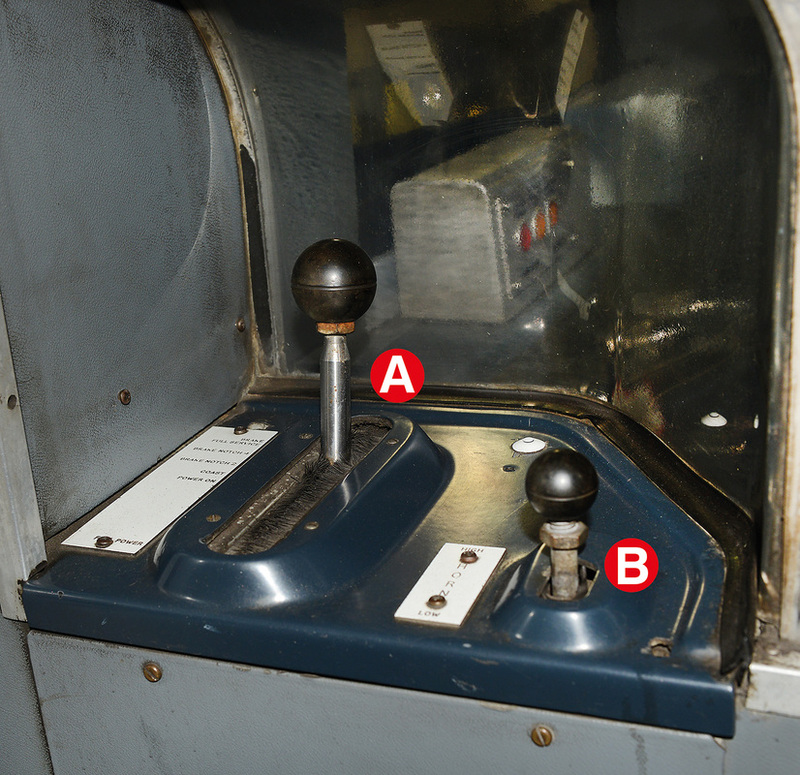 Left and Above, Secondary driving position (by door) A: Power/brake controller, B: Horn valve. 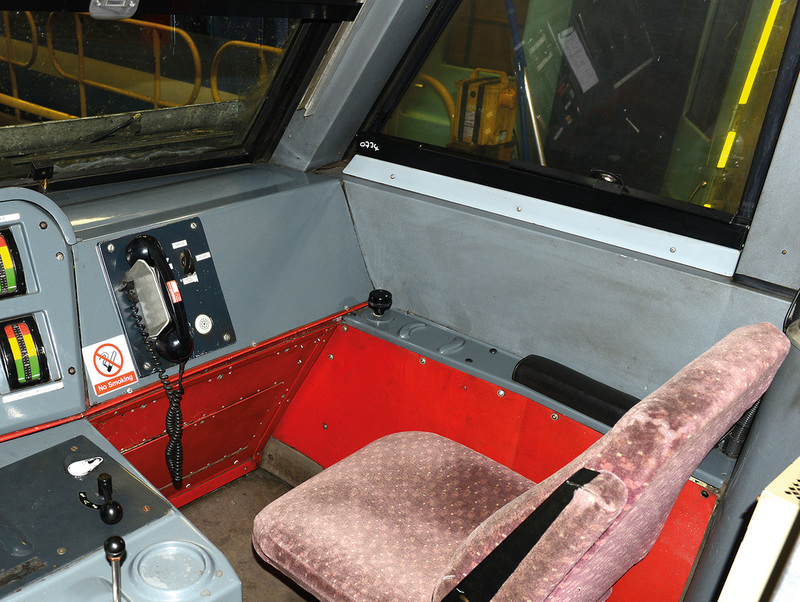 Below: Non driving cab side. 90007 in 2014 condition. 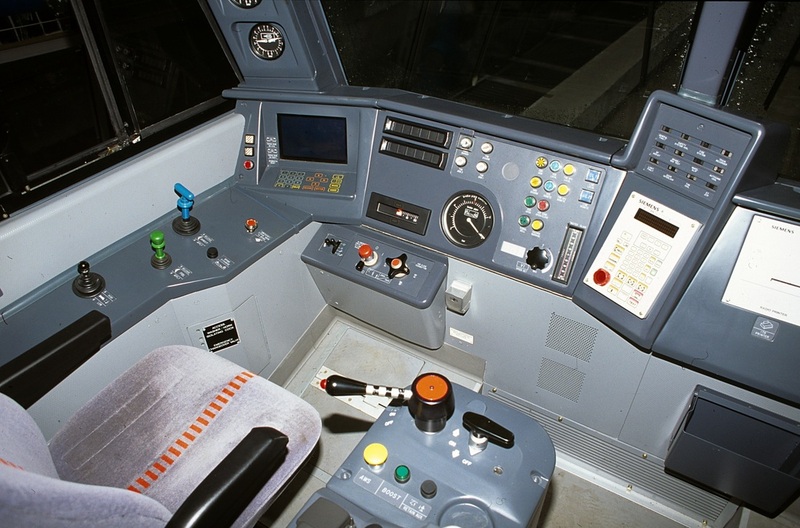 Above: Class 91. Above: As built condition (slab end). Above: Class 91 No. 1 end. Above: Class 91 No. 1 end refurbished. 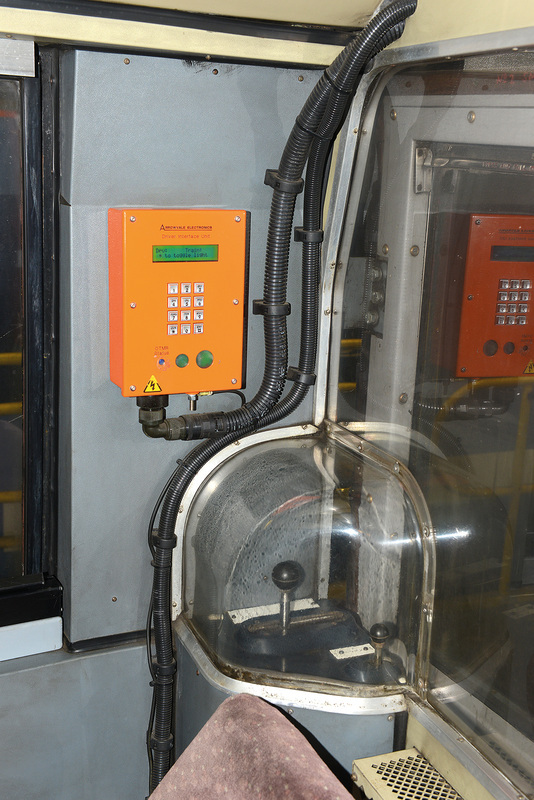 Fitted with TPWS, DRA etc. 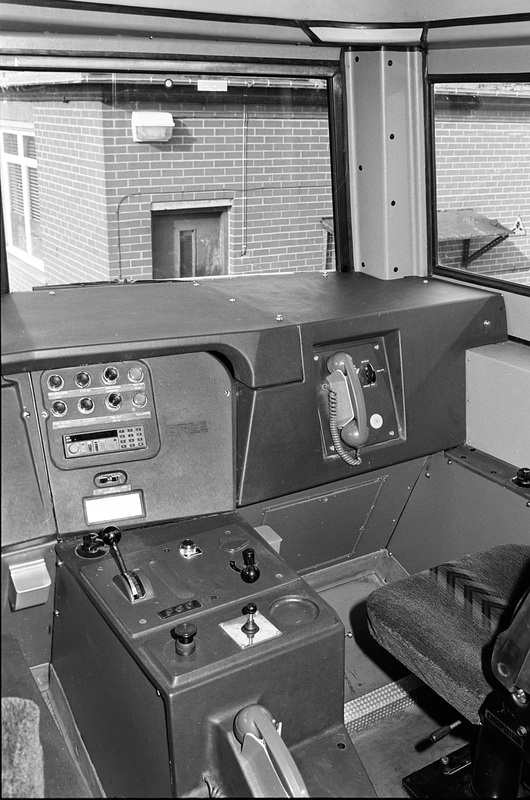 Left: Class 91 slab end, non-driving side. Above: Railfreight Distribution/SNCF Class 22 No. 22379.